Being a taxi driver is a very popular job in general, but few of them end up on the cover of newspapers or magazines. It does not make them millionaires or bring them eternal fame. The only time when they get attention from mass media is when they have terrible accidents or when they meet with aggressive passengers. Fortunately, some movie directors have decided to introduce scenes that happen in taxies or even to use scripts that are centered on cab drivers. Some of them are known among critics and are truly appreciated. Others are commercial comedies, loved by the public, but without any cinematographic awards. Let us see what films managed to stand out with the help of some memorable scenes or complex characters that impersonate taxi drivers. Night on Earth (1991) was written and directed by Jim Jarmusch. It has many international celebrities and 5 star Hollywood actors, like Gena Rowlands, Winona Ryder, Giancarlo Esposito and Roberto Benigni. The movie presents five different stories that happen in five different important cities: New York, Los Angeles, Rome, Paris, and Helsinki. The main characters are all taxi drivers and the situations are presented in a humorous tone: one cab driver is talked into becoming a movie star by his talent agent passenger, another driver is an immigrant and does not understand the client’s cultural habits, the third one has a blind passenger that initiates philosophical talks about life, the fourth driver is a gregarious Italian that kills his client with his talkative manners and the last action shows a taxi driver that has to listen to the gibberish of his client that managed to get fired from an industrial company. This is a comedy worth watching. 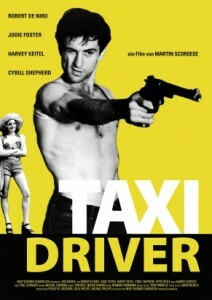 Another masterpiece is the famous Taxi Driver (1976), a movie written by Paul Schrader and directed by Martin Scorsese. This was a sort of launch to celebrity for Albert Brooks, Robert De Niro and Jodie Foster. These parts brought them public esteem and further good roles from the best Hollywood directors. The story is about a mentally ill war veteran that lives in New York and starts working as a cab driver, as he suffers from insomnia. His opinions about the world are very strong and when he meets Iris, a 12 year old prostitute, he decides that he was meant to save her, to be her knight in shining armor. The drama ends with crushed dreams on every side. If you want to watch an interesting movie with extremely talented actors, you should not miss out on it. We should not limit the examples to solely movies based on such scripts as mentioned earlier but also focus on TV shows or important short scenes from productions that have totally different storylines and no main cab driver characters. One example will be the series Taxi (1978-1983) with Danny DeVito and Judd Hirsh as main stars. The TV show is about a taxi dispatcher from New York City and the hired drivers. Important scenes can be found in movies like Who Framed Roger Rabbit(1988), The Big Lebowski (1998), Ghostbusters (1984), The Fifth Element (1997) and Die Hard: With A Vengeance (1995).